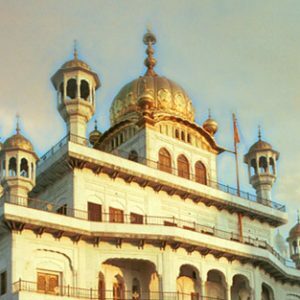 This past Sunday I wasn’t able to go to the Gurdwara physically, but it was awesome to be able to tune in and listen to the whole Gurdwara remotely through my cell phone (iPhone). A long while back I setup SikhNet radio stations on my account at: http://www.moodio.fm which is a free service which allows you to listen to streaming radio on many mobile phones. So there I was busy with various things but listening with my headphones on my phone. It was a cool experience to feel like you are actually there participating in Gurdwara, but in a virtual way. My consciousness was there, but not my physical form. By the end of the Gurdwara I could feel the energy of the Sangat through their voices. It was great! During Gurdwara the sangat listened to a wonderful lecture that SSS Harbhajan Singh Khalsa gave in Los Angeles back in Feb 6th, 1987. It was very inspiring to listen to and hear his description of the Akal Takhat in relation to the events of 1984. He also described in detail about the power of singing the Narayan Shabad as a way to retore the glory of the Sikhs and the Akal Takhat. For the past few months many Sangats have been gathering and singing the Narayan Shabad together every evening until June 6th. It has given so much strenght to our community. Please listen to the below audio and hopefully you will join in and start playing the shabad every day. moodio.fm changes its name to yourmuze.fm today. moodio links will work for the rest of 2010. A few nice new features the same great price!